Voucher codes and coupons for use when buying personalised books for kids at mumablue.com. MUMABLUE have storybooks for children capable at all reading levels, from beginners to advanced readers. All books are 40 pages in length along with double page illustrations in full colour and fully personalised for your child. Have you ever wanted to create a beautiful, personalized story for your children? Now you can with Mumablue. The website makes it extremely clear what you get the minute you visit. You’ll get to see some of the stories previously created, guaranteed to put a smile on your face. 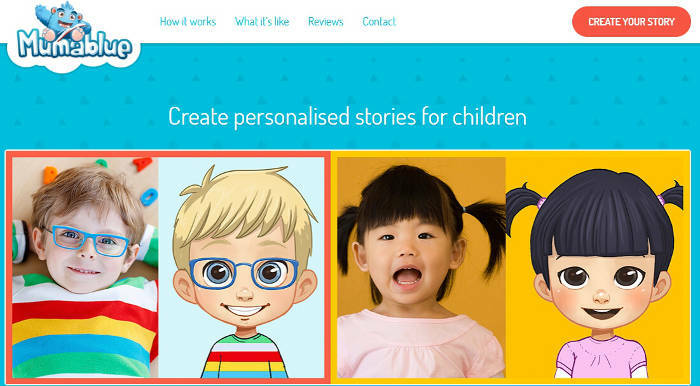 With a modern layout, it’s easy to find out how to make the story and personalize it with your child’s name and face. You can even easily sign up to the email list to get a reminder a few days before your child’s birthday so you remember to order the extra special gift. Mumablue knows how hectic being a parent is but doesn’t want you or your child to miss out. Of course, you have questions about the product and delivery. Mumablue has collected all the FAQs and put them in one place with answers so you can find them easily. You get information about the books, the delivery times and prices, and all about applying discount vouchers. Once you get a voucher code, it’s extremely simple to add it at the payment right at the end. Plus, payments are extremely easy to make with all credit and debit cards accepted. Getting in touch about anything at all is extremely simple. The homepage has a contact form at the very bottom. When you’ve placed your order, you’ll get the contact information depending on your needs, so you can discuss any defects, order extra books, and even to leave a testimonial. Going through the experience of making the book is fun. There’s something for all reading levels and this just makes a beautiful keepsake for children of all ages. The only downside is the limited stories right now, but that’s sure to grow!